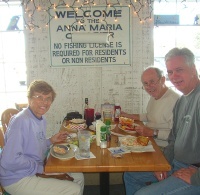 Anna Maria Island Restaurants include a variety of small local "good eats". There are plenty of seafood restaurants, quaint local restaurants and some fine dining options. Most restaurants are fairly casual....definitely "Island Style". Here are some favorite places to eat on Florida getaways or to Anna Maria Island. For a girls getaway, I recommend from the restaurants below....breakfast at the Rod & Reel Pier for a fun "on the water" experience. 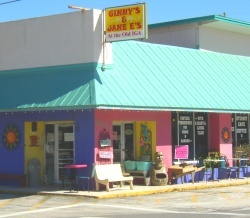 Then coffee and a sandwich or quiche at Ginny's & Jane E's where you can also shop for antiques and gifts! Watching the sunset and dinner at the casual Sand Bar or award-winning Beach Bistro is a great way to end the day. Ooh La La - Cuisine with an international flair, great desserts. 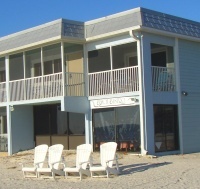 Beach Bistro - Award winning "best food on the Gulf Coast" by the Zagat Guide. On the beach. 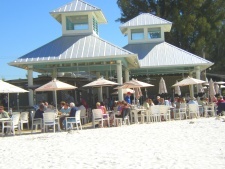 The Waterfront Restaurant - across from the Anna Maria Island City Pier. Interesting entrees, outdoor dining, serving lunch and dinner. 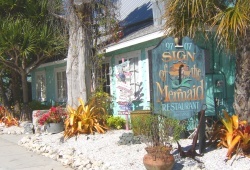 Sign of the Mermaid - Set in a small cottage, intimate atmosphere, nightly specials. The Sandbar Restaurant - Varied menu, nightly entertainment, beautiful setting right on the beach, fun place for casual outdoor lunch. If you are thinking of an Anna Maria Island Wedding or even a Bradenton Beach Wedding check out the newly renovated Sandbar. 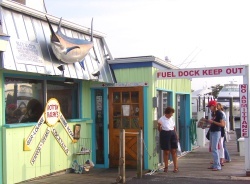 Anna Maria City Pier - Large Variety of Seafood and fish items, fun, casual location on the Anna Maria Island City Pier. Rotten Ralph's - Casual, marina restaurant with fun outdoor deck on the water. 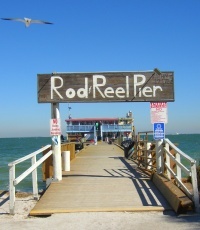 Rod and Reel Pier Restaurant - Another Restaurant on a pier, this one on the Rod and Reel Pier. We watched a fisherman land a 24" red fish when we were there for lunch. Lots of fresh fish and seafood items. Good place for breakfast. Casual! 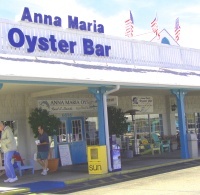 In Bradenton, Anna Maria Island Oyster Bar - Fun, family style seafood restaurant with reasonable prices. Busy - get there early. Duffy's - Casual, lots of locals, good hamburgers. Hurricane Hanks - Bar atmosphere, ribs, darts. Minnie's - Inexpensive, great place for "small town diner"-style breakfast or lunch. Ginny's & Jane E's - Very cute little coffee shop cafe in an antique/gift shop. Locals hang out here. Here is another restaurant recommended by a visitor. Don't forget to check out the Bradenton Beach Restaurants page on this website with other ideas for places to eat on Anna Maria Island. Enjoy eating at these unique and delicious restaurants on your Anna Maria Florida Beach Getaway!